A Registry Cleaner is a unique third-party utility for Microsoft Windows OS and used for cleaning redundant files from the Windows Registry. These programs are not directly supported or endorsed by Microsoft, but users have claimed that these utilities are helpful for keeping your registry clean and avoid system or app glitches. In this tutorial, we are going to introduce the best 10 free registry cleaners for Windows 10/8/7. Why You Need Registry Cleaner? On every Windows PC, the Registry preserves preferences and setting for the used and downloaded applications as well as for the Windows operating system. In other words, Registry works as a database. By default, the Windows system keeps on cleaning registry to a certain extent but the cleaning and filtering process in many cases remain incomplete and plagued by old and useless entries. These redundant files may start generating error messages and, in many cases, slow down the computer. It should be noted that cleaning registry will not greatly speed up Windows computer, but possibly fix some annoying issues. The good news is there are wide varieties of free registry cleaners for Windows PC. Simultaneously, the bad news is finding the best free registry cleaner is an extensive task. 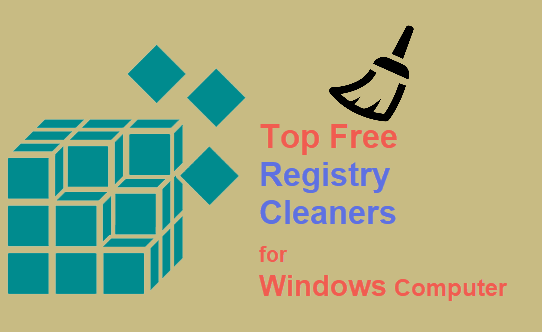 However, we have done the virtual market strolling for you and have presented the best 10 Free Registry Cleaners for Windows 10/8/7 PC registry cleaning. Another issue should be mentioned is that it is easy to lose important files if you are not cautious when cleaning registry on Windows PC. Therefore, you’re suggested back up your computer, such as creating a restore point. In case accidents do happen, don’t hesitate to use a file recovery software to undelete the files as soon as possible. CCleaner is a Piriform product. Hundreds of users have used CCleaner and have expressed their utmost satisfaction on its performance. The software program is built with neat and clean interface, and before it starts working takes conformation from the user about the backup support. CCleaner works for the system optimization, cleaning, and maintaining privacy features. It can eliminate unused files from the Windows XP/Vista/7/8/10 system and help Windows OS run faster. It also helps in keeping your hard-disk space free from junk. This free registry cleaner can clean internet history, too. CCleaner is available in both free and paid version. The paid version includes features like automatic browser cleaning, real-time monitoring, and priority support, etc. CCleaner is possibly the most famous cleaning tool for Windows computer, but it may be one of the following nine free registry cleaners that somehow suits your taste. Boosting PC performance by fixing registry. Facility of system tuning up optimization. This free registry cleaner software is developed by Auslogics. It is a user-friendly registry cleaner that offers a categorized list of the recommended changes for the quick view of the system owner. If you are the user, you can select the errors you want to fix. Its user interface is simple and easy to follow. Another advantage of using the cleaner is its ability to indicate the severity of the registry error already occurred. There are some other distinct advantages of using Auslogics. It takes the backup of the registry changes while continuing its repair process. However, you can prevent the registry backup simply by clicking on settings and then clicking on backup changes. You can contact rescue center to retrieve the changes implemented by Auslogics. Although it is a free tool without paid version, Glarysoft Registry Repair software is very powerful. Once you open the tool, the program will start scanning the registry of your system. While scanning, the tool keeps the backup of the registry in an automated process. This auto backup feature is a safety protocol for retrieval of all types of system error. If needed, you can click on action to restore previous repair version. Extremely brainy engine that detects invalid registry entries. Faster scanning speed with thorough result. Generating backups of all registry changes implemented. Increase system performance and constancy. Fast, systematic and safe scanning process. This registry cleaning tool is available in free and paid version. However, the free version will work fine for most of the users unless there are some critical issues. The best part of this tool is its comprehensive registry cleaning; however, you have to customize the cleaning process. The tool was developed by Toni Helenius with a minimalistic graphics. However, its visual appeal has not been improved much since 2005 after its launch. Primarily, the software will search the duplicate files for you and clean shortcuts which are already invalid or broken. The user interface is easy to understand and follow. Also, it is available in multiple languages. Argente Registry Cleaner takes longer time to complete its scanning process for registry cleaning. It is built with a wizard based UX where you as a user can opt for scan categories between automatic scan and manual scan. It is easy to use and you can undo the changes. It is available in a portable size. The tool works for Windows Vista/7/8/10 (32/64 bits) as well as for .NET Framework 4.5.2 version. The software is available in multiple languages like Dutch, English, French, Hungarian, Italian, Portuguese, Russian, Spanish, Ukrainian, etc. Safely scan the entire Windows registry for detecting and cleaning invalid or obsolete information. A user-friendly interface for safely finding and planning repair of invalid entries in the Windows registry. Enhance your computer’s speed by cleaning Windows registry. Improve your Windows PC’s general performance and stability. Find Windows Registry keys to detect from deleted files as well as from uninstalled applications. The auto backup creation is made of the repaired registry entries. Fast and powerful Windows cleaning facility. More stable Windows system, less crash. Improves performance of the PC. Faster PC startup and program launching. These are the best 10 registry cleaner tools you can use for cleaning registry of your personal computer at free of cost. However, these tools need separate installation formality and appropriate system compatibility. Before selecting a tool, you must check your system compatibility with the tool you have selected. Let us know your user experience with the tool you have used for registry cleaning. If you want to add any other name as free registry cleaning tool, let us know by commenting here.